Hello crafty friends! 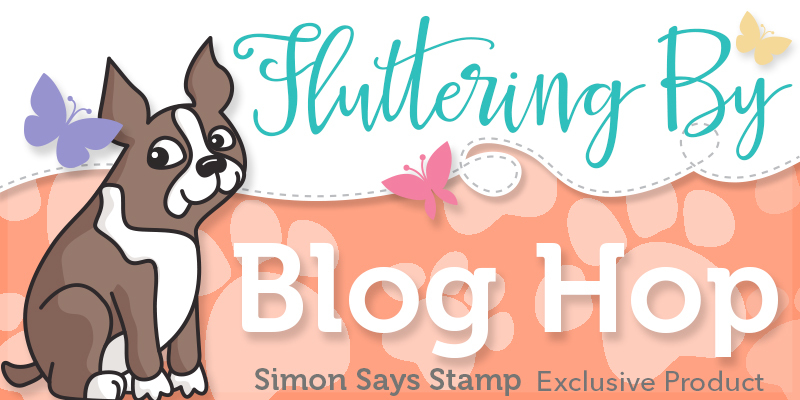 I am so glad you’ve stopped by today, as I am sharing more inspiration using the awesome Fluttering By release from Simon Says Stamp, PLUS participating in a blog hop! If you have already been hopping along, you should have arrived from the super awesome Cathy Zielske! 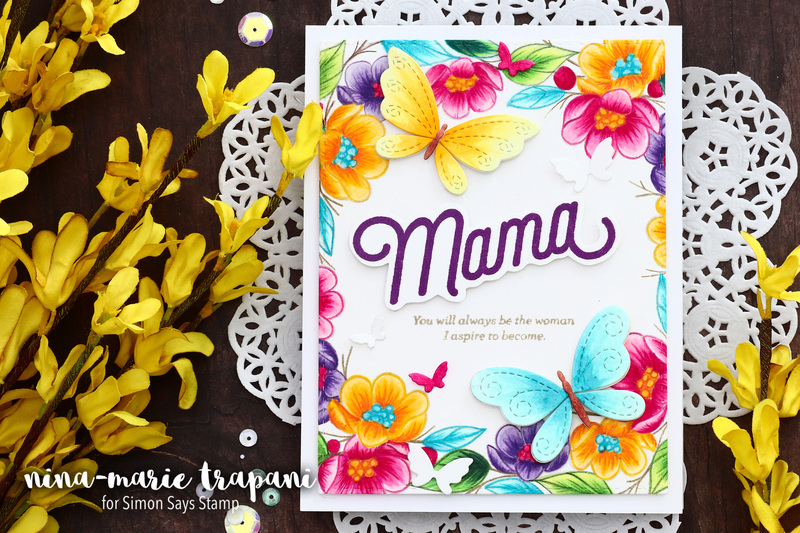 Speaking of Cathy, I used her new Love You Mama stamp set that she designed for Simon in the card I am sharing today! I love the pretty script and cute florals; they are playful and fun! 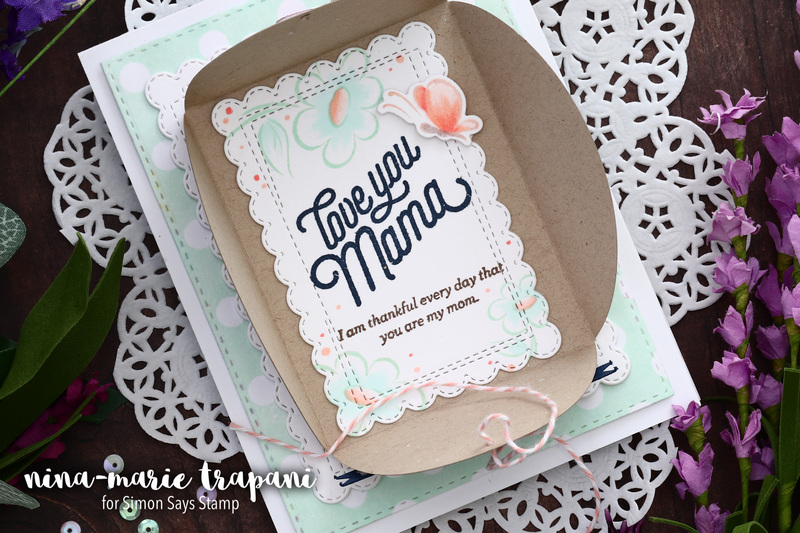 I used those stamps with the new Petal Envelope die to make a sweet, hidden message card! It reveals a fun message on the inside! I used a mom themed set of greetings for my card, but you can easily change the sentiments to fit whatever message you want to convey! Be sure to check out how I made this card by watching the video at the top of this post! 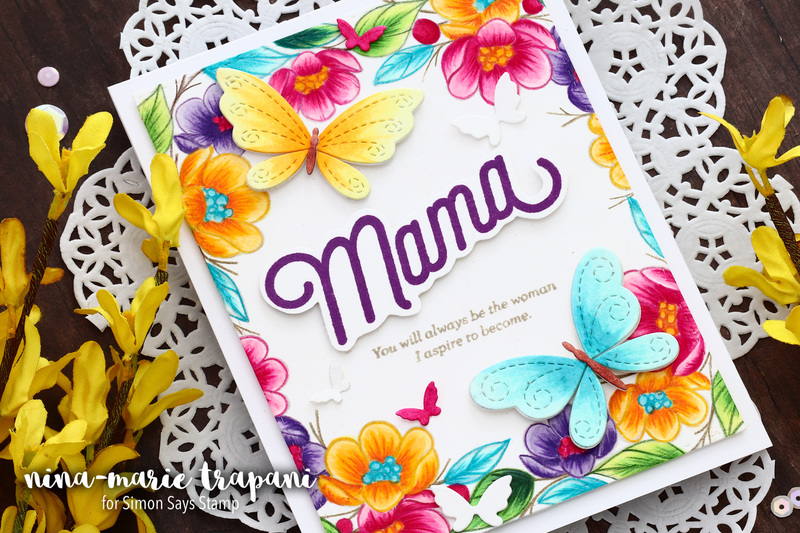 I really enjoyed using the Love You Mama stamp set so much, I had to use it again! This time I paired it with the pretty Center Cut Flowers cling stamp. This card took a VERY long time to create because I put so much detail into the coloring. I stamped the florals with an Ink on 3 Fadeout ink pad (perfect for no line coloring)! I used Copics to color the base shading, and then brought in colored pencils for the details. I loved the relaxing process of coloring, so I had a blast making this card. I embellished the card with the beautiful Stitching Butterflies and Flickering Butterflies die sets. 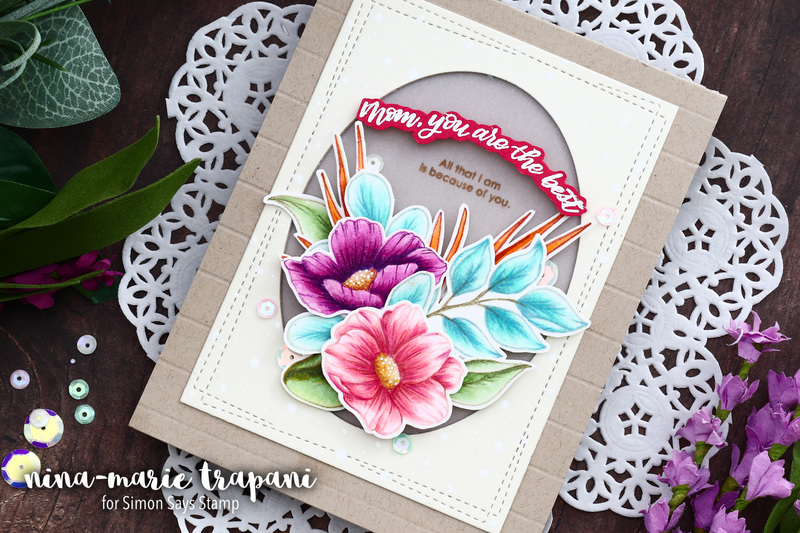 The final card I made for today features the lovely Mom’s Flowers stamp set! I adore floral images and these are perfect for pairing with other favorites you have in your stash. That’s what I did here; I added leaf images from the previously release More Spring Flowers and Even More Spring Flowers stamp sets. It’s fun to match up images from new and older sets to get fresh looks! I used the same Copic and colored pencil technique that I had used in the card above. I clustered the florals together and added sentiments that are from that same Mom’s Flowers set. To embellish the card, I included some of the gorgeous Butterfly Kisses sequins around the arrangement for a bit of sparkle! Don’t forget that there is lots more inspiration to see in this hop! Your next stop is the amazing Nichol Spohr! Simon is generously giving away a $25 gift card to every stop on the hop! All you need to do is leave a comment; if you comment on each blog in this hop, you’ll increase your chances of winning! Winners will be chosen and posted on the Simon Says Stamp blog on Wednesday. Thank you SO much for visiting with me today! I hope you were inspired by the projects I shared. Enjoy the rest of this fun-filled hop! Love all of your cards. I like the hidden sentiment on the first one and the bright colors on your second one. Great work and thanks for sharing. So sweet! I love the rectangular petal envelope, this is such a fun new release! three amazing cards!!! Love them all. thank you for sharing. These cards are so beautiful! I like the feminine, scalloped details. Wow such beautiful cardsjust like the creater. I love the variety of ideas you used from basically one set of stamps! Your cards are so colorful and cheery! Super cute! These cards are amazing. love the great envelope surprise on the first. Love the hidden message on the first card. Have to use this idea for a card of my won. The flowers on the next are fantastic. The colors are bright and crisp. and so lovely! What a sweet release! So pretty! Thank you or the inspiration! Your 3 cards are just stunning! God gave you a talent and boy are you doing some wonderful things with it. Your first card that opens up with the sentiment on the inside is so beautiful! I wish I could make a card like this but I don’t have a die cutter. Darn it! I’ve never seen a card like that. Your second card is one of my faves because you used my favorite color in the whole wide world, yellow. I love how colorful it is and I love all the flowers. I love the butterflies but again I don’t have a die cutter. However, I do have a paper punch so maybe I could do those butterflies! You’re coloring is so stricking! I can see why it took you so long to color. Your third card is also colorful and the coloring is so stunning also. I love what you did! Thank you for showing us your colorful and fun cards and for giving us the chance to win something. Thank you for much for picking me as a winner! I am so excited! I can’t wait to use my gift card to buy something to make my cards look really cool! I love doing blog hops because I get ideas for cards that I can make and because I can win something which I did. Thank again so much! Oh I love the “secret message” hidden inside the Butterfly card, what a wonderful idea. Thanks for the inspiration. These are amazing! You are very talented!